Fingerprint love scanner - the love calculator game for couples. Scan both of your fingerprints and the love meter will show you how compatible you are. 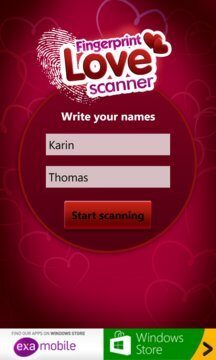 It's simple, place your fingertips on the scanner, keep them there for around 3 seconds, and you will automatically receive your love compatibility result and see if you're a good love match! After scanning your fingerprints, the love meter will generate a love compatibility percentage, which you can then share with your friends by email or SMS. The highest love compatibility result you can get in this love game is 100%. If the love meter indicates 100%, it means you are a perfect love match, and that you have passed the couple love test! It’s the perfect app for Valentine’s Day! Love games are ideal for this lovers’ holiday and a perfect way to check you love compatibility. Have fun with this love match game! We are planning to develop our application by increasing its functionality and adding new futures. If you have new ideas please send them to us via email app@examobile.com or write about it in the comments. We will develop the app accordingly so that it serves you well.